Hiking is a labor of love and the part of your body that takes the majority of the love is your feet. Our feet are the natural shock absorbers of our bodies and cushion each and every step we take on the trail. Most hikers experience some level of discomfort in their feet at some point in their pursuit of hiking. A common reason that foot pain becomes an issue is the sole of a shoe that fits poorly. Your hiking boot provides ankle stability and support, but what if the sole of your foot hurts after a long hike? If foot pain is something that you struggle with then finding a good pair of inserts can help mitigate the pain. The best course of action is to first see a licensed professional and then find the proper insert. This is where the Superfeet Green vs Blue comes into play, read on to find the similarities and differences below and which one is best for your feet. 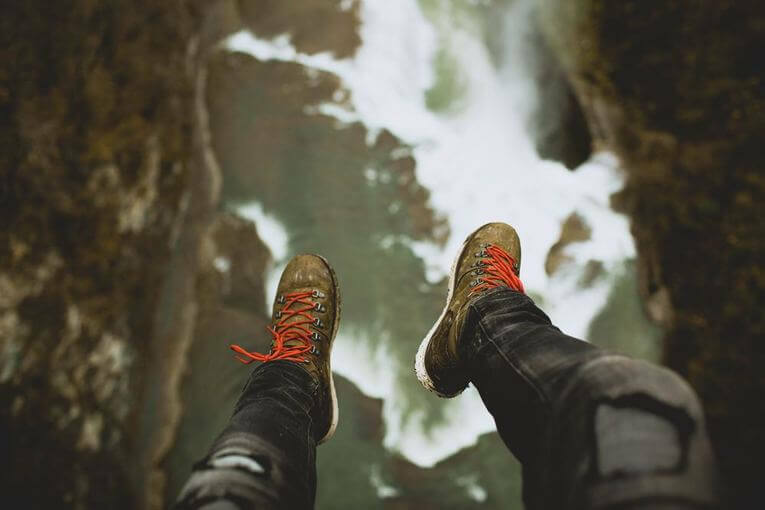 Here are five of the most important factors to take into consideration when looking for a new pair of insoles for your shoes or hiking boots. Insole sizes are there to help you choose the right insert that will comfortably fit inside of your shoe. You’ll notice that the sizes for full-length inserts range in the area of a couple sizes, like men’s 9.5-11. The reason that they aren’t a single foot size is that shoe companies sizes vary, so they are made to be cut to fit. If your feet are in between sizes, it’s recommended that you go with one size up. This gives you the confidence of knowing that it won’t be too small and you’ll just have to do a little trim job. When using a full-length insole you are expected to remove the existing insole that comes with the shoe. Most, if not all, full-length insoles are made to completely replace the insole that comes from the factory. This is especially true for Superfeet’s line of insoles, they are all high volume which translates into large and in charge. In other words, plan on taking out your current insole and replacing it with Superfeet Green or Blue. Keep in mind that wearing an insole that is not designed for your specific arch type is going to produce the opposite desired effect, pain in the feet. When searching for insoles, first identify the type of arches that you have and then choose the insole that fits your arch accordingly. Cork – Support and a light amount of cushioning. The type of footbed that you need is going to depend on what you need out of an insole. If you have any questions, the best plan of action is to head your local podiatrist and have a professional evaluate your specific needs. This way you can find exactly what your foot needs since no two feet are the same and the doctor may recommend a particular footbed style based on the size and shape of your feet. Superfeet color codes all of their insoles so that you can easily determine which insoles best suit your feet. The main difference is the type of arches that each one supports. Superfeet green insoles are designed for high arched feet and have a high-density foam layer that sits towards the back of the foot. They fit the best in high activity shoes such as work or hiking boots. Their durable construction provides you with reliable support for 500 miles or 12 months, whichever comes first. They are a high profile insert that comes with a deep heel cup that provides excellent shock absorption and support in high activity footwear, like hiking. They have a bio-mechanical design that gives you stability along with improved control and power, these soles measure 2 inches high at the thickest point and 4 inches wide. They offer your feet a firm feel and cushioning with arch support that fits high arches comfortably. If you spend a lot of time on your feet throughout the day, have pain after a long hike, or your feet hurt after work due to high arches, Superfeet Green insoles are worth your consideration. Superfeet Green are high profile inserts that are made for high arches with a high volume (they are large inserts). These insoles relieve pain that is felt in the middle of the foot for anyone that has an active lifestyle or spends a significant amount of time walking around. 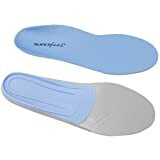 Superfeet Blue insoles are medium profile insert, in other words, they are best for someone who has feet that are in between flat and high arches. They deliver medium support and the stabilizer cap adds structure and extra cushioning to the heel. The insole itself is a medium volume insert, meaning that it doesn’t take up too much room in your boot. You have the option of trimming Superfeet insoles so that you get the perfect fit. Considering that all shoe companies have minor size differences, cutting the insole to fit gives you the flexibility to make Superfeet blue work with any shoe. Superfeet Blue is a medium or intermediate shoe insert with a high volume. That means that they are designed for feet that have medium size arches and the medium volume means that they take up a little less space than Superfeet Green. Superfeet Green vs Superfeet Blue really comes down to the size of the arches in your feet. They both provide your feet with cushioning and support, two of the most important factors in finding a good shoe or boot insert. Superfeet Green Insoles are best for people that have high arches and Superfeet Blue Insoles are best suited for those of us who have medium arches. If you’re not sure which one is right for you, you can give them a test drive or head out to any shoe store and ask them to measure your arches. It only takes 5 minutes to measure your arches and most, if not all, shoe stores are happy to measure your foot.